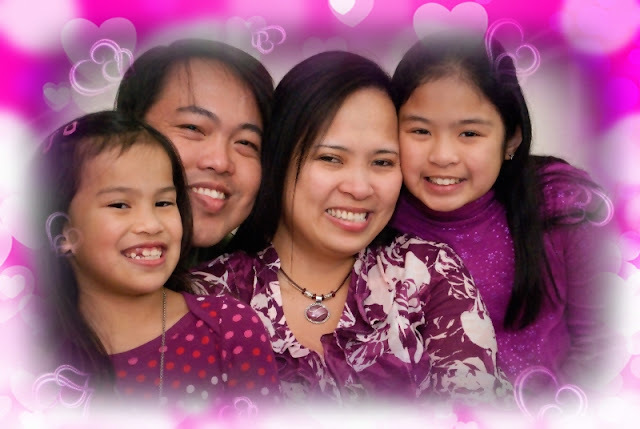 This month's Kulinarya Cooking Club Challenge hosts, Abigail of My Nappy Tales and Marni of Kensington Kitchen want us to share a dish that reminds us of our first love. But that's not what I'm doing. Instead, I am sharing with you a dish that reminds me of those wonderful first years of my relationship with Ryan while we were still taking up engineering at the University of Santo Tomas(UST). Those were the days when we didn't have money to eat at fancy restaurants, and a twice-a-month date at either Goldilocks or Shakey's Pizza just across the UST Engineering Bldg. in España was all we could afford. Aside from Pancit Palabok, Filipino-Style Spaghetti, Lumpiang Shanghai, Pork Siomai, Chicken Lollipops, Bistek Tagalog, Binagoongang Baboy, and Baked Macaroni, there is this food that we really loved to eat at Goldilocks. Not only is it delicious, it's also cheaper thus perfect for our tight student budget. 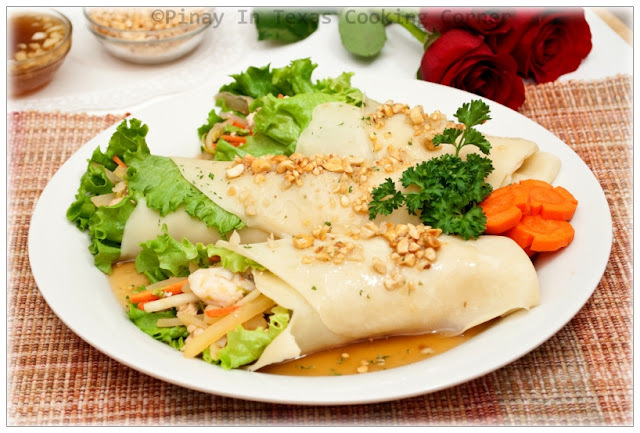 Just as the two of us were falling more in love with each other, we were also falling for Goldilocks' All Veggie Fresh Lumpia which is similar to the Chinese non-fried spring rolls. 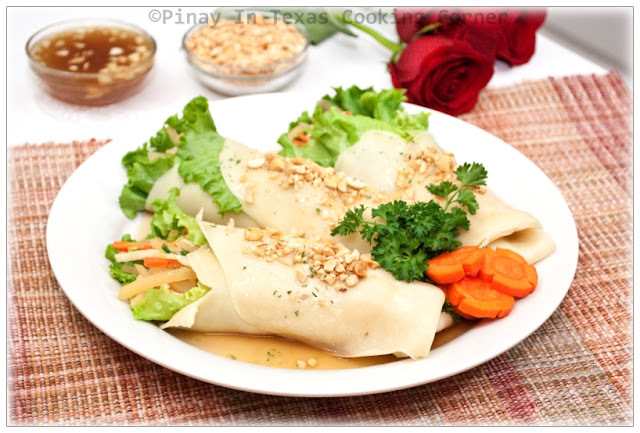 We just love how good those strips of carrots, green beans, mushrooms, squash, and lettuce were rolled in soft lumpia wrapper and topped with their signature lumpia sauce. 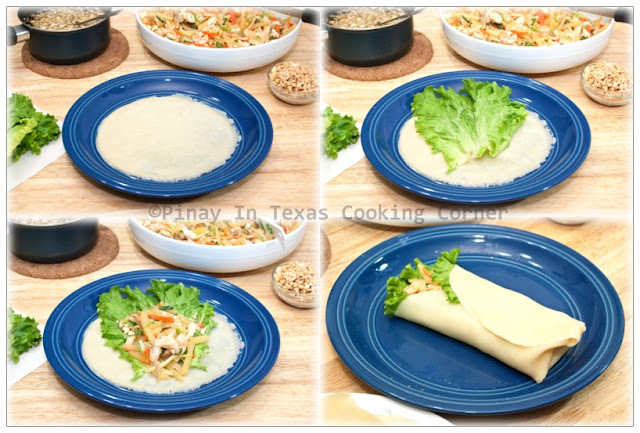 We've honestly eaten tons of it, and had I not started making it at home, we could have been awarded Goldilocks' Most Frequent Fresh Lumpia Eaters. LOL. 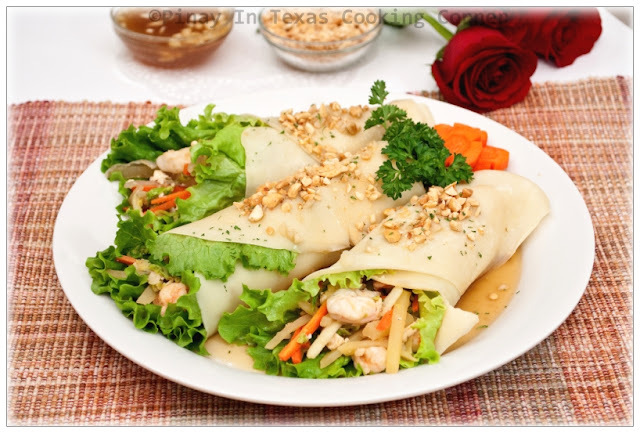 Kidding aside, Fresh Lumpia is really delicious that's why we really love it. 1. In a large pan over medium heat saute garlic, onion, potatoes and Knorr cubes in light olive oil until potatoes are almost cooked. 2. 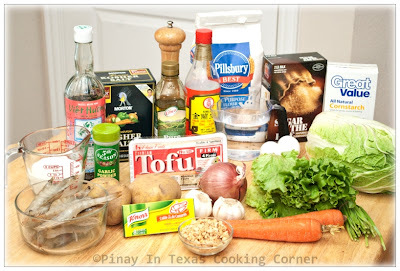 Add napa cabbage and carrots. Saute until carrots are cooked but still crisp. 3. Add shrimps, tofu and fish sauce. Mix well with other ingredients. Simmer just until shrimps turn to pink. Season with salt and pepper to suit your taste. Simmer for another minute. 1. In a mixing bowl, crack the eggs and whisk. Add flour, milk and water and continue whisking until smooth. Add garlic powder, salt and olive oil and whisk some more. 2. Over medium heat, heat up a slightly greased non-stick pan. 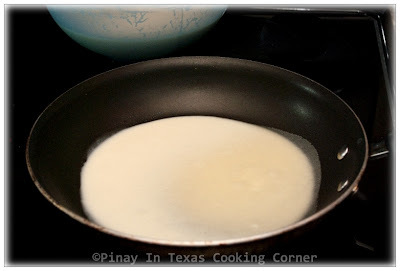 Pour about 1/3 cup of mixture and tilt the pan to distribute the batter evenly. Cook until the top part of the mixture is dry. Gently invert onto a plate. Repeat the procedure until you use up all the batter. This will yield 14 pcs. 9-inch wrappers. 1. In a saucepan over medium heat, mix 1 ¾ cups water and sugar. While stirring, bring to a boil until sugar is dissolved. 2. Mix the cornstarch with the remaining ¼ cup of water, and pour in the saucepan. Stir until it thickens. 3. Add the soy sauce and garlic. Stir and simmer for about a minute. 1. Place a wrapper on a plate then place a lettuce leaf on top of it. Scoop about 1/3 cup of filling onto the center. 2. Gently fold the lower part of the wrapper then fold each side of the wrapper towards the center. 3. Drizzle with sauce and garnish with coarsely ground peanuts.